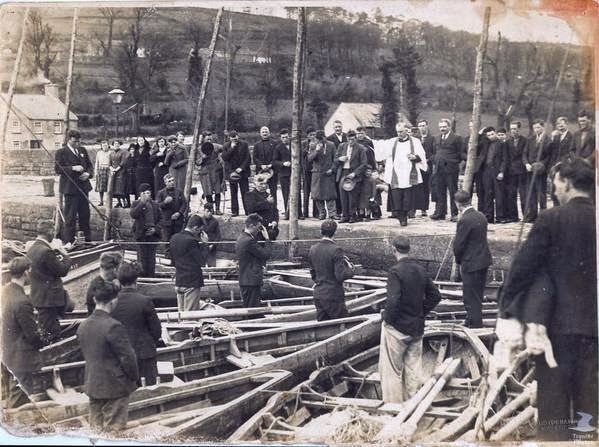 The traditional start of the Salmon drift net season in Ireland was, for generations, February 1st. Once opened it stretched to August 15th, the Feast of the Assumption, and a very important church holiday in the village in the past. By the time I started to fish the season had been shortened to commence on St Patricks Day, but I was raised on stories of the February start and the harsh winter conditions faced by my father and my mothers people. My maternal Grandmother Maura Moran raised me on stories of the conditions her father (Michael) and brothers (Ritchie, Paddy, Christy, Mickey, Johnny and Willie) faced while drifting for fish. One of those earliest memories I believe, was the smell of drying clothes at the open fire day and night. All the outer garments and even the socks steaming away on the fire, and her mother, Catherine, often up through the night, keeping the fire in and turning the clothing, so that the men would be some way comfortable going back out to fish. That might be the following morning, or in a short few hours depending on the tides. The season in those times closed each week between 6am on a Saturday morning to 6am on the Monday. Once the week opened it operated for 24 hrs a day. Walter Whitty (RIP) told me that as a child he remembered seeing “oilskins” hanging to dry in the high street. These were not the comfortable oilskins of today. These were homemade, by the women generally and cut from calico purchased in town. The calico would be measured, sown and then soaked in linseed oil to keep the water out (or at least some of the water). They would then be dried in the sun and be fit to wear. My Grandmother said that often as not an oilskin might return from sea journeys and during WWII might wash up on the strand or in the nets, but in general the men wore thick overcoats to keep the weather out and always a few pairs of socks if they had them. Terry Murphy (RIP) once told me a yarn. 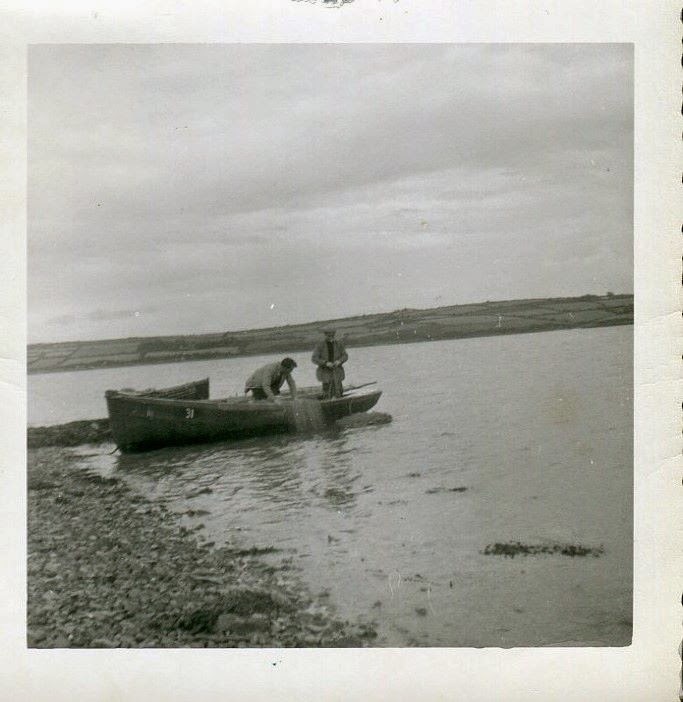 He was only a boy and was fishing with Billy the green, grandfather of Elsie Murphy. He called down this cold frosty morning and Billy came out with his socks in his hands. He plunged the socks into the water barrel and squeezed them out. He then put them on his feet and put his boots on. Terry paused for dramatic effect and looked at my puzzled expression. “Well” he said, “when you are on the oars all day the water in your socks heats you up better than any hot water bottle”. It was often I saw the proof of those words since, I have to admit. Returning home was also work of course. The hemp nets that my Grandmothers father and brothers used had to be ranged out of the boat and “spreeted” – hauled up and dried in the wind. Not doing so would shorten the life of the nets which was a cost they could not afford. So on returning to go fish, the nets had to be lowered and then ranged back into the boat. Any wonder the majority of my gran uncles took the boat to America or England as soon as they could. Any wonder also that it was the older men and young boy that did the fishing in all the other families around, those old enough choosing the emigrant boat or a sea going berth, at least until the summer peal run. 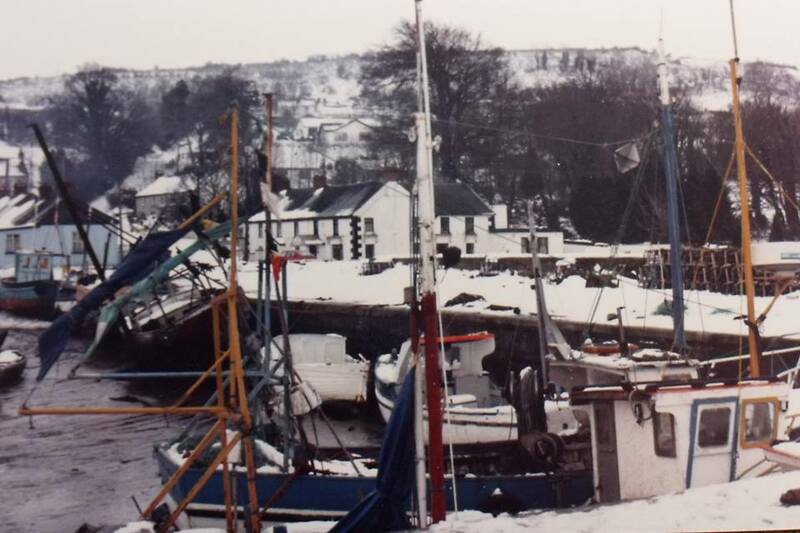 As I mentioned in my own time, the start of the season had been shifted to St Patricks day and in the 1990s (1996 I think) the season was destroyed from the perspective of commercial fishing in Cheekpoint in that it was reduced to a June 1st – Aug 15th season and operated from 6am – 9pm. It was a slow strangulation of the fishery which eventually closed in 2006. Funnily enough in those times there was hardly a week went by without some media outlet decrying the state of the Salmon fishery and trying to close down the drift netting as a means of preserving the Salmon stocks. Salmon stocks have not recovered however. Now those media outlets have to look beyond the traditional bogeyman, and yet seem unwilling to challange any sacred cows such as farming, industry or forestry. Two weeks ago we looked at the mine incident that closed the Barrow Bridge in 1946. It was a floating mine, the origins of which was not identified, but it had been in the water for some time. It might conceivably have dated to WWI. At the time the mouth of the Harbour was regularly mined from German submarines hoping to interrupt allied supplies. The allies were also deploying mines, most of the access points to the Northern and Southern entry points to the English coast were blanketed by mines in a futile attempt to thwart the u boat menace. The German mines at the time were a contact mine which were deployed initially from ships but from June 1915 were planted from U Boats. 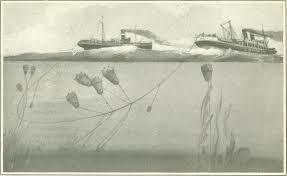 The mines were anchored by cable to the seabed and with enough draft to stay below the waterline. They were pear shared, 3ft in diamater and filled with 350lb of TNT. The top of the mine had 5+ horns, with a glass tube inside, which when a ship depressed, it broke and released a chemical to detonate. 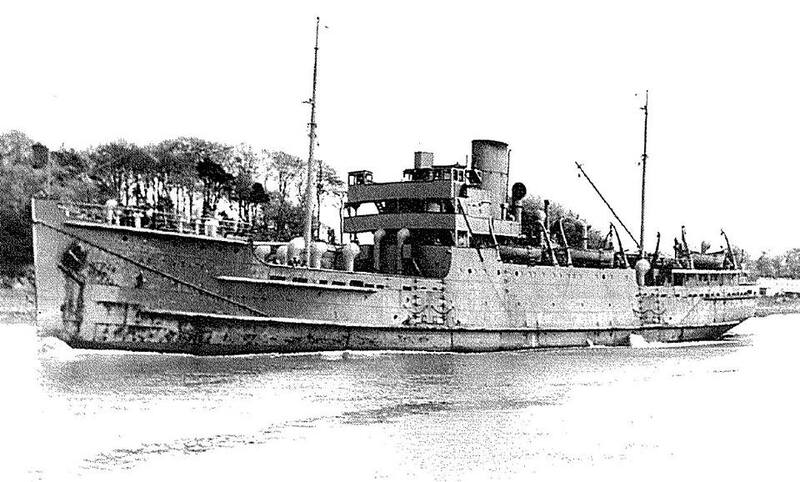 The first Irish casualty of the mines was the SS Manchester Commerce which was sunk off Donegal 26th Oct 1914. It was December before the admiralty realised it was the victim of a minefield and it would be July 1915 before they were satisfied that the estimated 200+ mines had been cleared. Gives some sense of the difficulties posed. Tebbenjohannes and his colleagues were regular visitors to Waterford Harbour, trying to interrupt the flow of resources to allies. Deployed at night from a submerged sub, the task of clearing mines fell to converted trawlers and their crew with a token naval presence aboard. Two boats would work together drawing a metal rope between them in an effort to locate the sunken bombs. The risks were high and any mistake would see the loss of the boat, and most probably the crew. For example in the weeks previous to the arrival of Tebbenjohannes, one boat was lost, but the crew of the minesweeper was rescued by fishermen from Dunmore. According to Wikipedeia the total number during the whole of WWI was 235,000 sea mines and clearing them after the war took 82 ships five months, working around the clock. Somehow I doubt they found them all. Any cursory search in the Irish newspapers will highlight the scale of instances since WWII of mines being brought up in nets. Had the naval personnel realised the longevity of the metal mine and or perceived how post war fishing practices would develop and the scale of bottom trawling they may have reconsidered their disposal strategy. Dozens of these articles relate to Dunmore East and vessels out of Dunmore and I was present in the 1980’s for one such adventure. The details are sketchy I’m afraid, as I could find no record in the newpspers. However I remember a particularly nasty SE wind and a trawler coming in off Dunmore, but refused entry. The trawler was being towed if I recall correctly. The mine was trapped in the nets and part of the nets had fouled the screw. Holding off Dunmore, a team of army bomb disposal experts arrived in Dunmore that day. I vividly recall their energy and enthusiasm as they jumped out of a dark green jeep with large kit bags and boarded the Betty Breen to go out to the trawler. However, they were back after an hour, green in the face and much less energetic. The trawler was sent over under the Hook and the decison was taken to await a team from the Navy to deal with the issue. Many readers will know that we have a holy well in Faithlegg dedicated to St Ita. January 15th is her feast day, (she reputedly died on this day in 570AD). We looked at St Ita around the same time last year, and I left it with a question in terms of why the well is dedicated to her. I still haven’t answered this to my personal satisfaction and have a few more thoughts on it, but to begin, here’s an overview. Various sources state that Ita was born Princess Deirdre, to King Kennoelad and Queen Necta of the Deise tribe in Waterford circa 470AD. Her birth place is not certain but the majority of written accounts speculate that it was in or around Ballyduff, Kilmeaden. A few online sources have claimed she was born in Faithlegg. mother of the saints of Erin”. 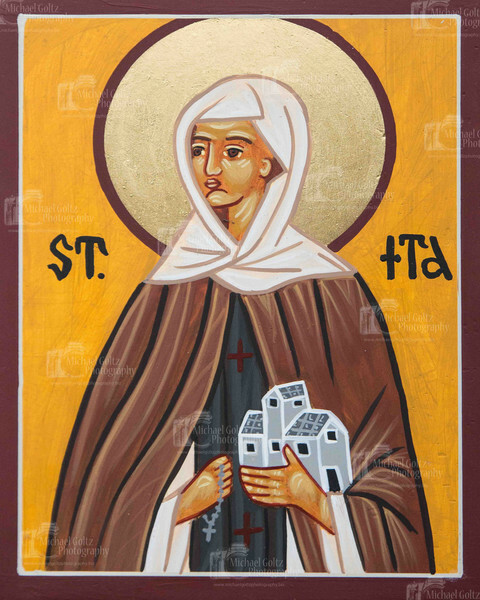 St Ita is often described as the Bridgid of Munster, highlighting her position in the pantheon of Irish female saints, a close second to Bridgid of Kildare. Last year I speculated on several theories about the well being dedicated to her at Faithlegg. However this year I wanted to highlight what for me is an inconsistency. You see when Canon Power was doing his famous work on the Placenames of the Decies (published in 1907), he actually mentions several wells in the area, but omits any mention of St Ita. I find it puzzling that Power would have no mention of a christian saint, if such a name was associated with the well at the time. Maybe he was going with the earlier work of another renowned placename researcher John O’Donovan and the staff of Ordnance Survey Ireland who between 1829 and 1842 completed the first ever large-scale survey of an entire country. Acclaimed for their accuracy, these maps are regarded by cartographers as amongst the finest ever produced. We’ve seen the lengths these early map makers went to for accuracy with the name of Faitlegg previously. fact that Power was a local (Callaghan), would have surely strengthened his knowledge of the area. Deena had a suggestion that Foxes were associated with saints and perhaps that would explain a connection. She found stories associated with St Moling, St Kieran, St Patrick and even St Bridgid but none for Ita. the moved into the area in 1819?. Or is it an older name, that came to light after the efforts of the OSI and Canon Power. Again, only more research will possibly tell. The Barrow Bridge was officially opened in 1906 to connect Waterford’s train station, and thus the SW of Ireland, to the newly developed port at Rosslare. 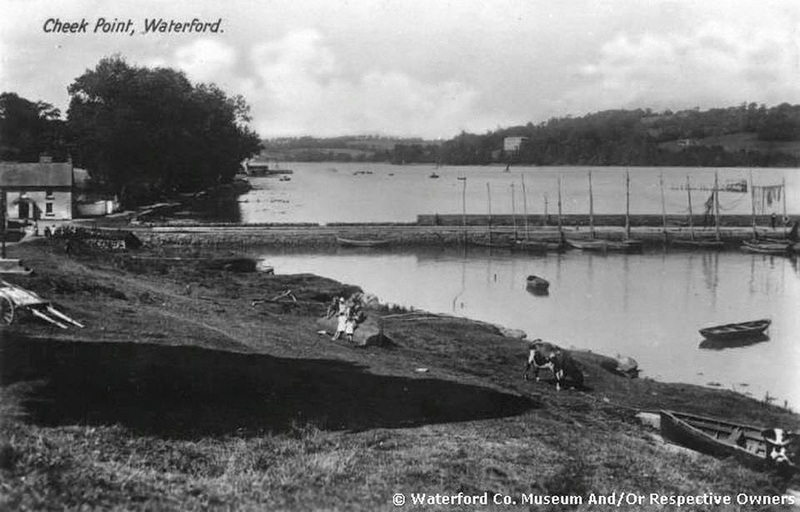 I’ve written before about the initial planning and concern about crossing the River Barrow which separates counties Kilkenny and Wexford, across from Cheekpoint. The principal objection was from the Port of New Ross. The concerns were addressed by inserting a swivelled opening span to allow ships access to the River Barrow and thus New Ross. The outside channel was used for ships entering the Barrow, the opposite, on the Kilkenny side, for egress. A manned control tower operated the opening and closing function. Down the years there have been many incidents recorded at the bridge, what follows is a sample. Another curious incident is related in the Munster Express dated 9th June 1923. The opening span was stuck in an opened position for some days following a loss of a “Shaft” or pin, which was central to the operation of the swivel action. The shaft was finally retrieved by dragging the river bed. No explanation is supplied as to why it happened, or indeed why a replacement could not be found. My mother like so many others left for England in the 1950’s. To her the bridge brought mixed emotions, sadness on leaving, fires burning in the village, the last farewell to the emigrants that would keep families fed. Of course it was also of gladness when she would get to return across it for the following Christmas and it would give her the first view of home. By far the most curious incident to close the line occurred on Friday 22nd March 1946. A drifting mine – used during the second world war- was spotted floating close to the bridge by two Cheekpoint men Heffernan and O’Connor (Paddy and John respectively as far as I can recall, John being the father of the Munster Express journalist of the same name). They reported the sighting to the Garda station in Passage East and a unit from the Curragh was dispatched under Comdt. Fynes to deal with the threat. Locally it was always said that the boys had thrown a lasso around the mine and towed it away from the bridge as a train approached, saving countless lives as a result. The bomb disposal unit had to wait for the tide to go out before they approached the mine on the Saturday. It was described as 5′ 4″x 3’4″ and was encrusted with rust and barnacles. 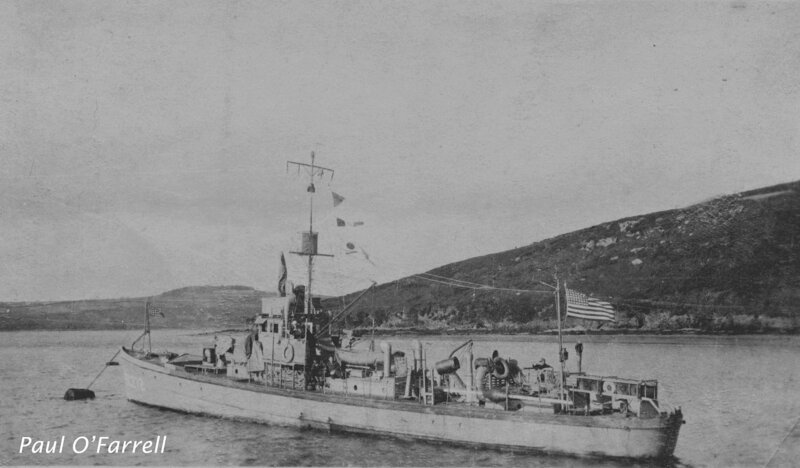 It was thought to have been a floating mine, deployed with an anchor and chain that had broken away. The opinion of the army was that it had been deployed on the sea bed several years before, There was no information provided about it’s origin. The unit managed to make safe the mine by 4pm that evening, meaning the 5pm train could depart with safety. again, and with empty pockets, glad of it. reflecting the restlessness of the river. seas breaking in on Broom Hill (Wexford side) looking fairly ominous. of. Standing was difficult, and making your way round the deck took planning, attention and luck. then I started to yawn, deep yawns which seemed to rise out of my belly. longed to believe that the worst was over. this was dashed when we marked a sizable lump of herring and Jim shouted to set. nets out and the tea brewed, I forced a cup of the hot sweet tea down. Boy Alan. I wondered what he would make of me. I said a quick prayer to our lady, asking for the strength to finish the job, not let myself or my father down. Again the sickness came, but it was a dry wretch, more painful and debilitating. Tea over, Denis checked the net. but I know that I didn’t have anything left to vomit as we proceeded. would go home that night and return in the morning to shake out the nets. “How’re ya today?” he asked. laugh, and started to feel a little better. father’s traditional opening lines to a yarn. heard of the carry on, he grabbed a fire axe and splintered the cabin door. He grabbed the young fella by the throat and dragged him to his watch. it was Robert Ferguson, come to collect me father in his white Hiace van.